This is the most stylish and best powered USB hub we’ve ever seen. 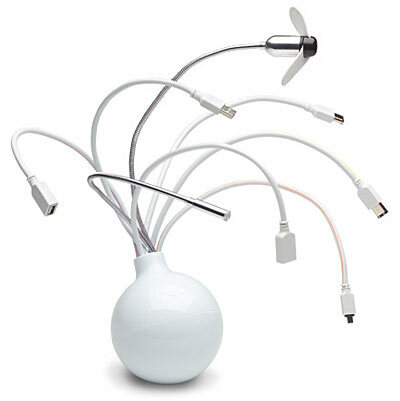 The Medusa Hub supports four USB 2.0 ports up to 480Mbps, two Firewire 400 ports up to 400 Mbps and comes with a USB fan and USB light attached. Works in most Windows, Mac, and Linux OS and available now from ThinkGeek. Medusa was a mythical creature, a Gorgon woman with snakes for hair that was so ugly she’s turn anyone who looked at her into stone. While we don’t think anyone will turn to stone gazing upon this stylish and functional USB gadget, we do think it would look awesome if each tentacle had a Master Chief USB drive plugged in, dangling in mid-air with their little USB heads missing.